This uneven attempt to update Sue Townsend's playfully political tale can't work out what, or who, to laugh at. “Many of you may feel that our country has become a laughing stock through a self-inflicted act that has done great damage to our standing in the world.” That’s The Queen (Samantha Bond) speaking in The Queen and I, Sky One’s family drama for the festive holidays. Based on the Sue Townsend novel of the same name, it updates the 1992 text to a contemporary setting – and, in doing so, pitches the programme straight into the complex confusions of 2018 Britain. Yes, Sky One has given viewers Brexit for Christmas. 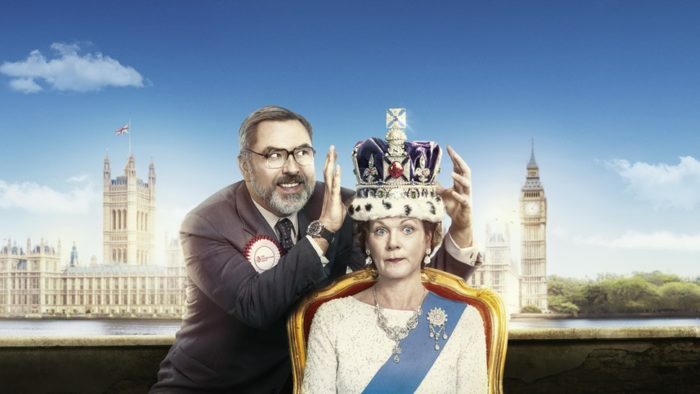 Adapted by Stephen Russell, the bare bones of the plot are the same: Jack Barker (David Walliams) is elected Prime Minister of Great Britain, and with his party pledging to remove the Royal Family, that election victory leads to them doing just that. And so the monarchy is disassembled, with queenie and chums booted out of Buckingham Palace, given a state pension and sent to a council estate to get on with their lives. It’s a neat idea, with Sue Townsend using it for some gentle satire and warm comedy. This new update, though, looks for a more topical bite and can’t quite work out where to sink its teeth. As a republican figure, Barker perhaps most closely resembles Jeremy Corbyn, leader of the Labour Party at the time of writing. But upon his election to office, the squirrelly politician begins the un-Labour-like process of selling off the nation’s assets, desperately bringing in tacky sponsorship deals and privatisation wherever possible. The cast, for their part, are likeable, with Samantha Bond’s Queen wonderfully earnest, Julia McKenzie as her mother (another factor in the drama’s unclear chronology) enjoyably inapproprate and Oliver Chris’ Charles charmingly nice-but-dim – within days, his kids, Will and Harry, have adapted to tough school life far better than the rest of the clan. The rest of their working class neighbourhood are also given more depth than the script might suggest by the cast, including Johnny Vegas as a well-meaning handyman. Walliams, who is dangerously close to saturation when it comes to Christmas telly, plays his part with an aptly frantic quality, wide-eyed in his frenzied realisation of what he has to do to pull off his campaign promises, but there’s little logic to Barker’s behaviour, even fewer laughs along the way, and zero sense to the drama’s sentimental message: is its point to highlight how much we do need the Royal Family? To comment on the folly of democratic votes on drastic state overhaul? Or to mock the opposition to a government trying to pull of a Brexit that, with her remarks, Samantha Bond’s Lizzie could well be referring to? Family entertainment doesn’t have to take political sides to be entertaining, but by trying to take Townsend’s tale into the modern age, The Queen and I’s quest for relevance leaves it feeling curiously out of step. The Queen and I is available on Sky On Demand. Don’t have Sky? You can stream it legally on NOW TV, for £7.99 a month, with no contract and a 7-day free trial.